I don't even need to say what the above conversation is concerning, because anyone who has ever parked in a lot with angled parking has had it numerous times—even if there's nobody else in the car. Angled parking accomplishes nothing except delaying and angering people. This is such a common occurrence, I've created the portmonteau “Delangering.” to describe the experience. Delangers come any time someone drives through an angled lot. Without fail, the direction the car is going will have absolutely no parking spots angled at it. A quick look to the left though reveals parking space after glorious black topped parking space. Or maybe one, but what remains is it is an open space, and trying to park there is nigh impossible. One could awkwardly back into the space, or do an exceedingly wide turn that would scrape large chunks off the Camry parked next to the space. They could also continue around the parking lot, trying to loop back and grab the space. Each present a problem. Backing into an angled space is insanely awkward, will probably anger people on both sides of the road and get you stabbed. 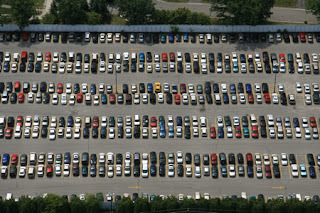 While circling around will just cause all of the open spaces to mysteriously vanish—just the nature of angled parking. You'll note, both add to the delangering activities of the day. 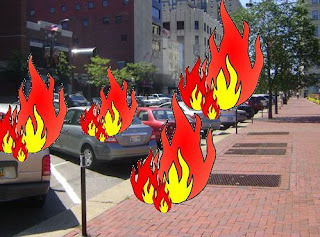 It's true, angled parking serves absolutely no purpose (aside from the aforementioned getting you stabbed). It just makes it harder to park. Sure, it might be argued that it's slightly easier to pull into an angled space than a sane space, but that's debatable. What isn't debatable is it's much harder to back out, much harder to see people, much harder to drive. Oh yeah, I guess it's also easier to run over small children, so angled parking does have that going for it. Normally with problems this great, it requires some sort of paradigm shifting idea to solve. Some new and novel way of thinking, like composting or not dropping nuclear weapons on anything with a pulse. However, the solution for this one is actually quite simple—normal parking. By normal, I mean straight in, straight out. Introducing slants into the equation just wrecks things. And by “wrecks things,” I mean the most literal definition of the phrase. There is a reason some call this parking at the right angle. The wackiest reasoning for angled parking is the claim that is actually saves spaces. But no. In addition to being a waste of time, angled parking also wastes space. Let's take a second to compare though. A lot that uses normal parking has the capability of being 100 percent full. It could have the only open areas be the lanes to get to and from parking spaces. Whereas with angled parking, there's always going to be the small little triangle at the very end of the lot where nothing, not even a Hummer H3 (the small Hummer) could fit. It seems people will continue constructing their lots in this insane fashion. My solution, fight this wrong with a massive wrong. Don't give into the angled nature of the lot. Park in the space like a normal person would, at a 90 degree angle. Some might decree you a pig parker, but if they want a space, they need to follow your lead. Suddenly, that angled lot has become a normal lot and people will delight in their ability to park normally. And then we've started a revolution.